Decades of industrial logging in Australia’s wet forests have made them more fire prone, raising urgent fire management issues, according to an ANU academic. Urgent fire management issues must be raised. Professor David Lindenmayer of the Fenner School of Environment and Society challenges current fire protection practices in the March issue of Australasian Science magazine. “Much discussion focuses on how to best protect human lives and built assets,” Professor Lindenmayer writes. 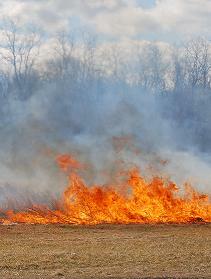 “But management also needs to counter the effects of past forestry activities on fire regimes. “A prominent question is how much fuel or hazard reduction burning is needed to reduce risk. However, widespread fuel reduction burning is not an option in Australia’s moist forests and rainforests as they are generally too wet to burn in a controlled manner. Conversely, past forest management, particularly logging operations, may have significantly increased the fire risk. “Research in tropical rainforests suggests that logging reduces the number of dry days needed to make a forest combustible from 30 to less than eight days. Logging also alters the density and spatial pattern of trees, the spacing between crowns, and other forest attributes in ways that increase their susceptibility to fire. In moist forests in south-eastern Australia, logging has shifted the vegetation toward a composition that is more characteristic of drier forests that tend to be more fire-prone. No Replies to "Forest logging creates fire traps: academic"